Automatic download settings tell Comodo Dragon whether and how it should handle data downloaded from websites that you visit. Click 'Content settings' > scroll down to the 'Automatic downloads'. 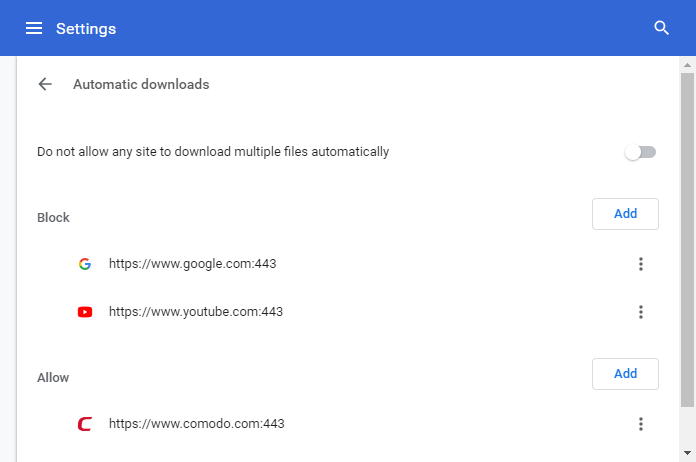 Ask when a site tries to download files automatically after the first file (recommended) - An alert will be shown when a website tries to automatically download multiple files. The first file will be allowed to be downloaded without any alert. Do not allow any site to download multiple files automatically – Dragon will not allow websites automatic download of multiple files. Comodo Dragon allows you to control automatic downloads for some specified domains or websites. Enter the domain name in the text box below 'Add a site' to create an exception. Insert [*.] before the domain name to create exception for the entire domain. For example, [*.] comodo.com. Non-http url, IP address and IPv6 address can also be entered. In the 'More action' three-dot drop-down box, select either 'Allow' or 'Block', 'Edit' or 'Remove'.